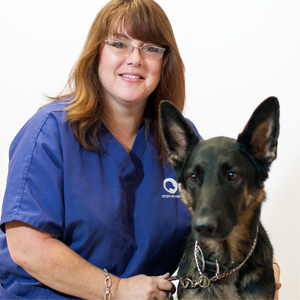 I’m Margo and I’ve been training dogs for over 15 years. I am a CGC (Canine Good Citizen) evaluator and certified trainer. I have completed a 500-hour dog training course with special attention to behavioral modification, fears, and phobias. While working in the veterinary industry and participating in obedience competitions with my own dog I saw a huge need for early training of dogs and helping to educate owners on how to achieve a balanced loving relationship with their family members. I also raise and train alpacas and enjoy volunteering my time by taking my own K-9’s and alpacas out into the community as goodwill therapy ambassadors working at senior care facilities and with cancer-stricken children.